You guys are probably thinking 'Another beauty box? How many is she subscribed to?'. Truth is, I am only subscribed to the BirchBox Subscription service as if never fails to impress me, and this box is no different. 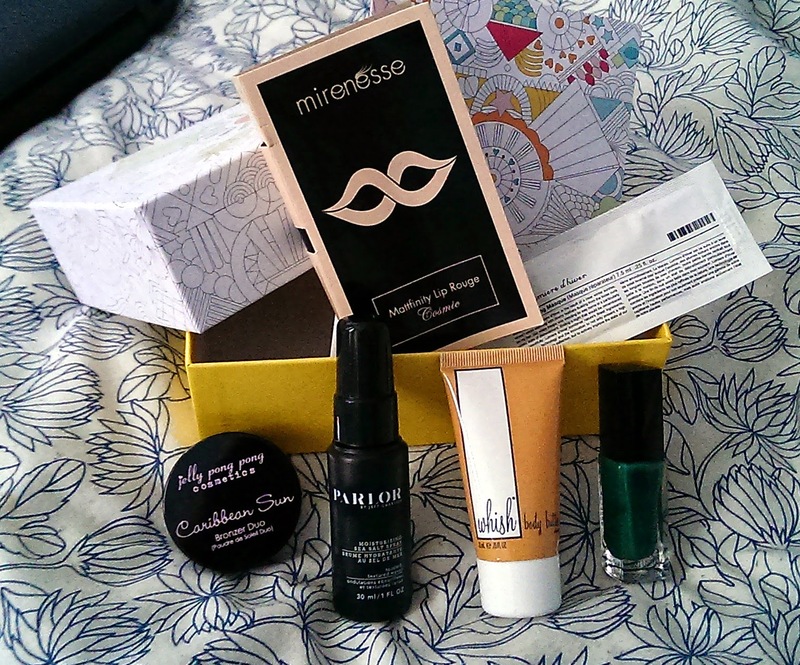 (All the other beauty subscribiton boxes are a one-off purchase.) 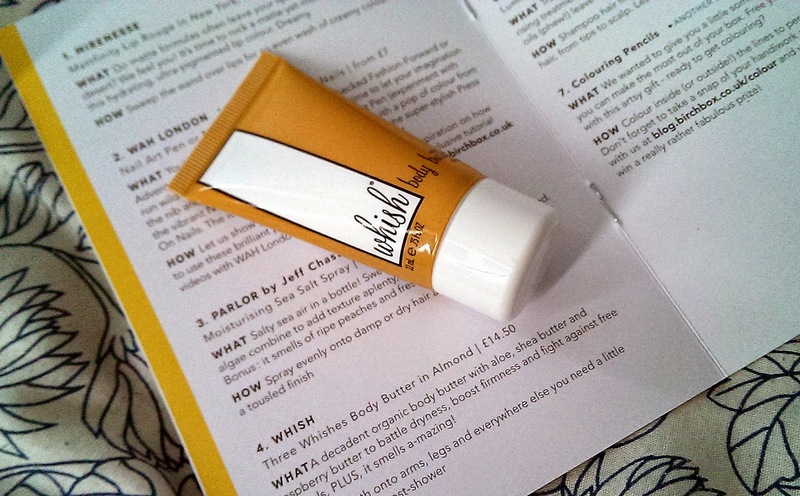 If you have not heard about BirchBox you are definitely missing out in some good stuff. In England we don't have beauty subscription services like Ipsy and BoxyCharm. 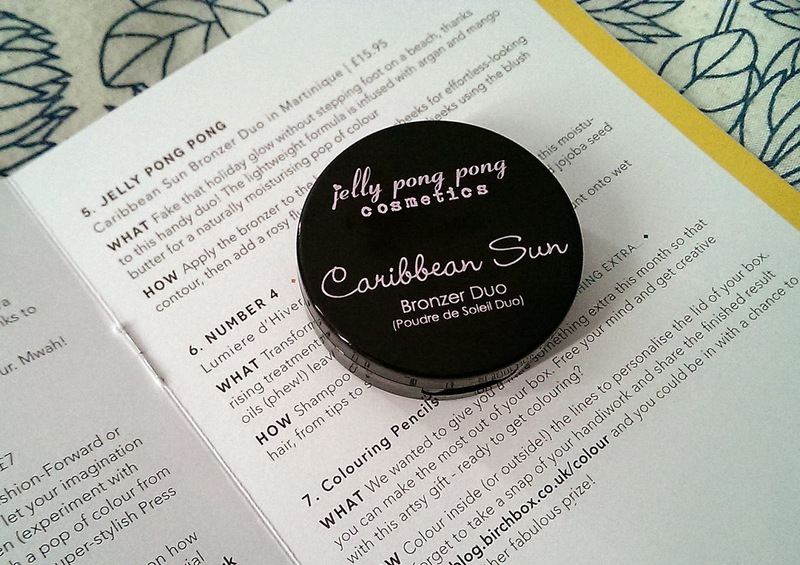 And I do feel we are missing opportunities to try out different brands, however Birchbox tries to bring in brands that we have difficultly getting hold of. 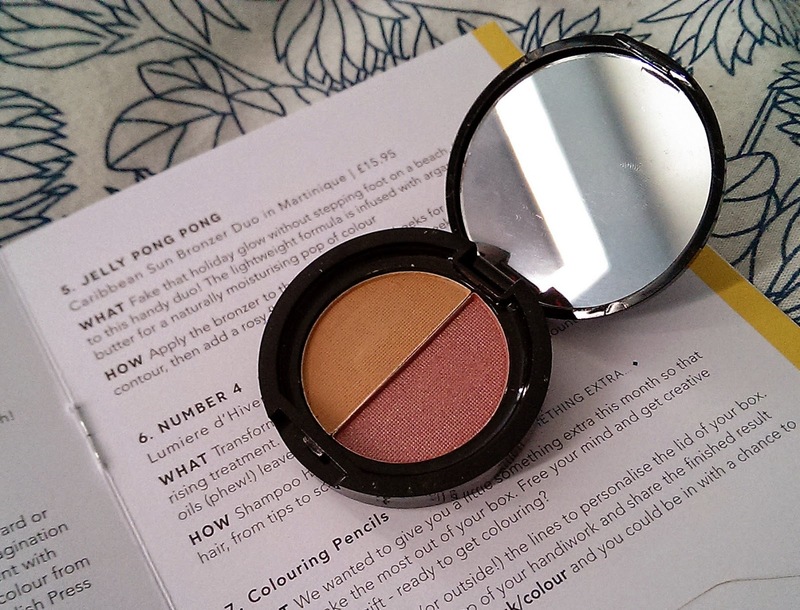 This for example can be the BeautyBlender which you can purchase off the Birchbox website. 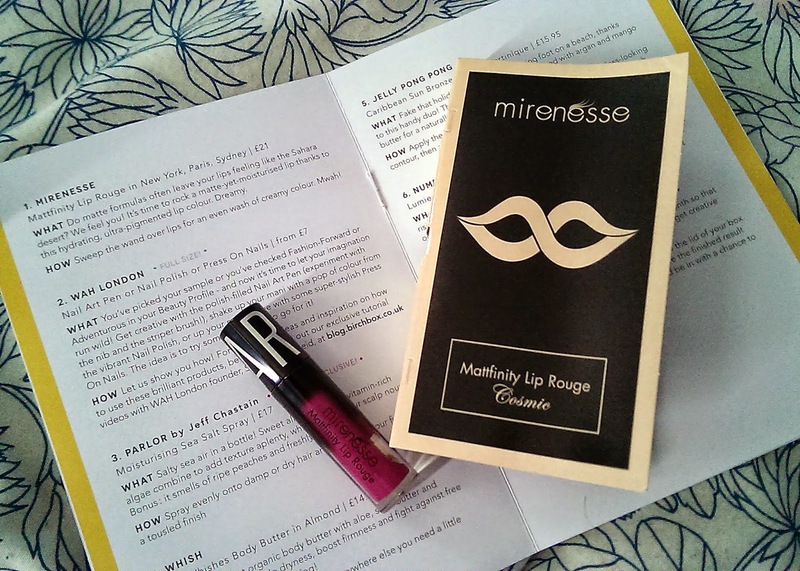 With BirchBox you collect points when you review products that you have tried and tested, which turns into rewards points, allowing you to purchase full size products. Getting to the good stuff, this month I have received 6 samples and some colouring pencils. 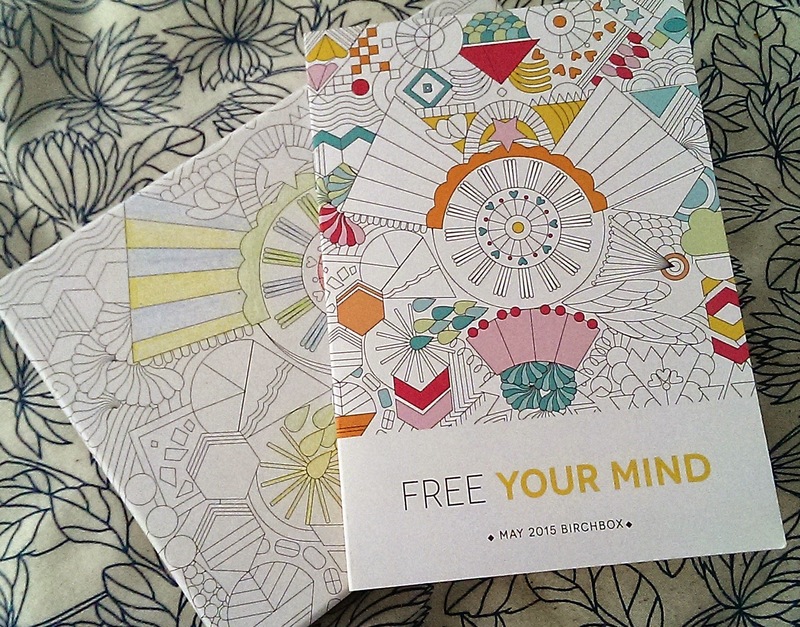 The theme is called 'FREE YOUR MIND', letting you get to your creative side, which is where the coloring pencils come in. I coloured some bits of the box, but I found that it was difficult because of the texture of the box itself. It took up 10 minutes of my time before I got bored haha. A very rich matte lip colour with infinity wear with a 'lip hug' applicator Has a tattoo like staying power and velvet finish. 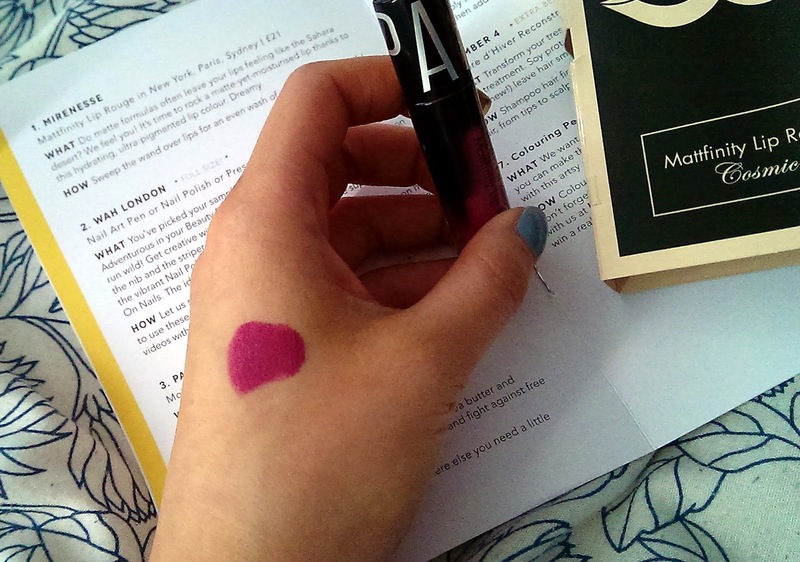 The formula when swatched on my hand was very rich just like described in the description, The colour paris is more of a magenta colour, I believe this will look different on my lips, as I have quite pigmented colouring. There is a slight scent of the product, quite sweet but also lip product smell, I do not know if that smell will fade away when worn. I first discovered Wah London on Instagram, You need to follow them there, they share amazing photographs of members of their teams designing nail art onto clients. They were located in one of the London stores. And have now launched their own collection of nail art pens, polish and press on nails available on Boots.com. This is a full size product. 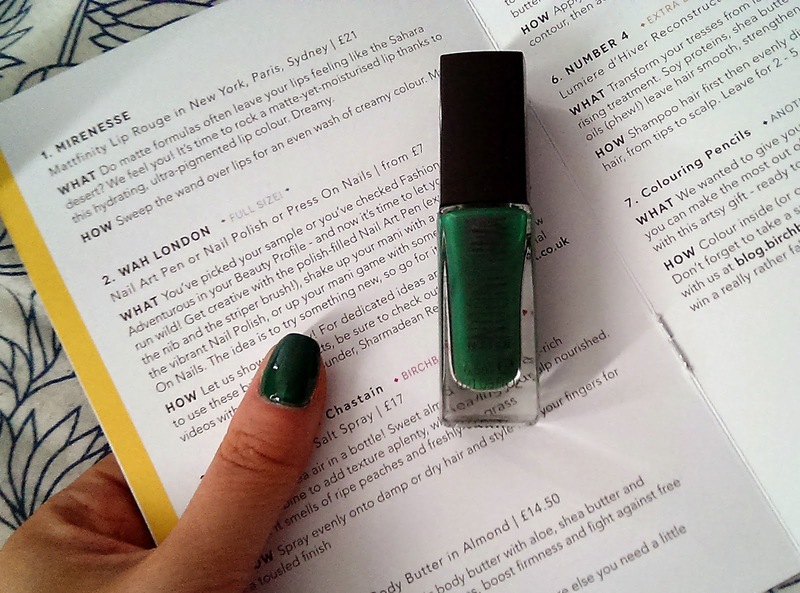 I received 'Be Better Not Bitter' which is a lovely emerald green, one of my favourite colours. I only needed two coats to achieve the intensity shown in the photograph. 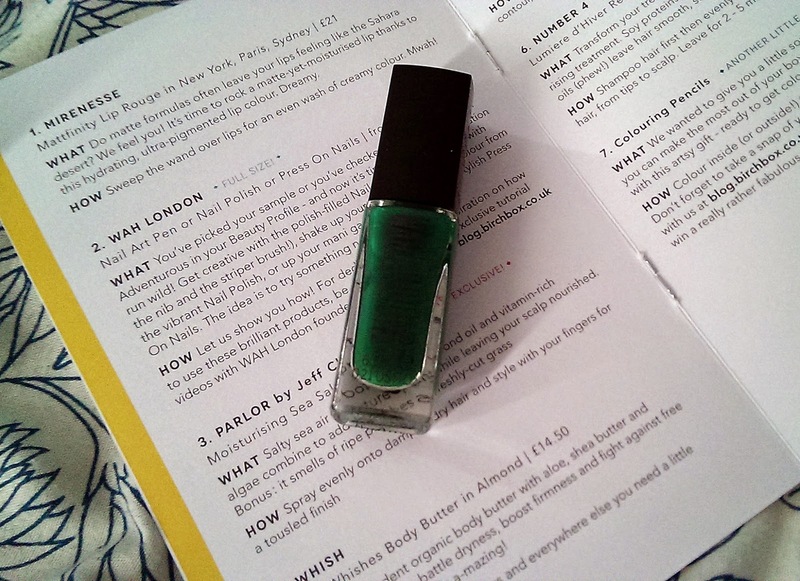 I am excited to find out the lasting power of these nail polishes. Contains sweet almond oil and vitamin-rich algae. 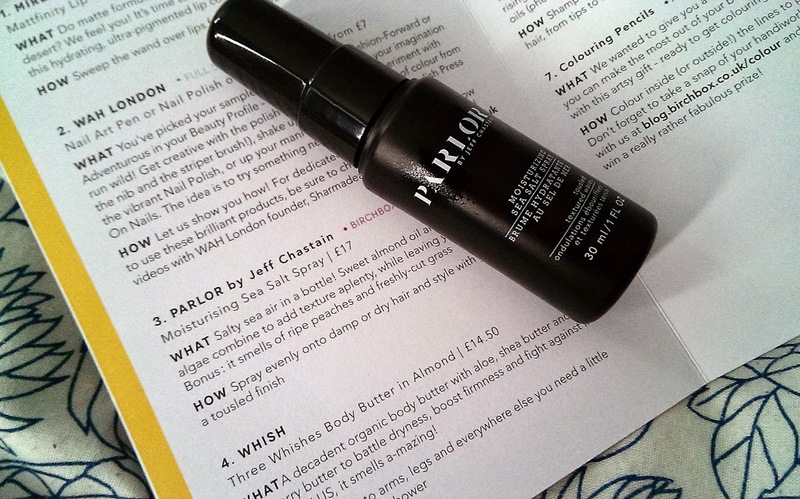 Who is not excited about a Sea Salt Spray - Beach waves here I come! This smells of peaches and freshly cut grass - so If you have hayfever you might have a problem with this as it has a strong scent. Organic body butter with aloe, shea butter and raspberry butter to battle dryness, boost firmness and fight against free radicals. This smells really good, a bit like Cherry Bakewell tarts. the smell lasts on your skin. It has a thicker consistency and has seaweed extract to firm. Who wouldn't want firmer and softer skin? I received my sample in the shade Martinique. I believe this shade is a bit light for me. The texture is really smooth and is build-able. 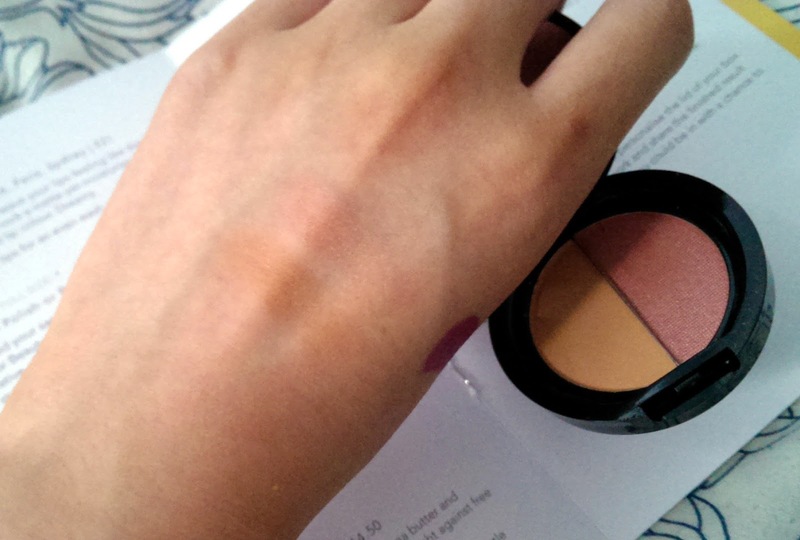 The blush in the duo has light shimmer finish. Transforms your tresses from lacklustre to luscious with this moisturising treatment . Includes Soy proteins, shea butter, sunflower and jojoba seed oils, leaving hair smooth, strengthened and shiny. 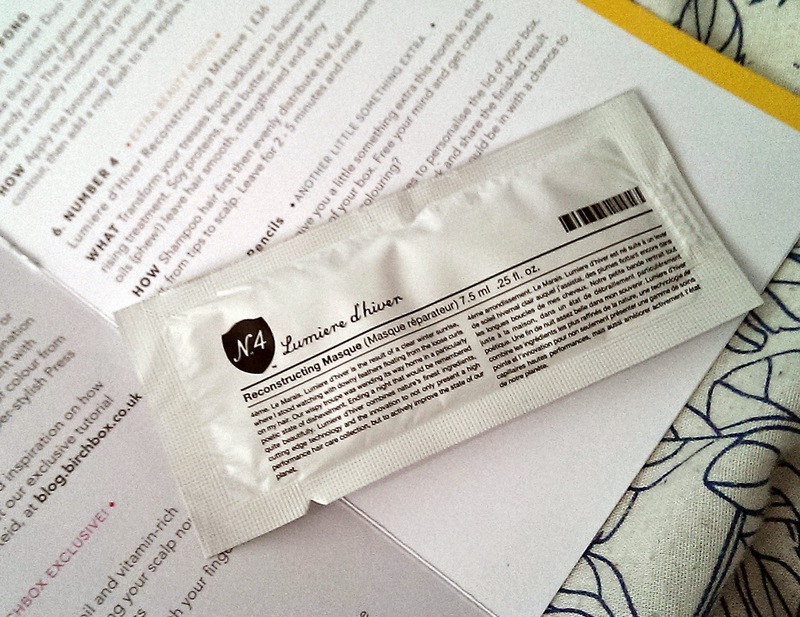 I love using hair masks as my hair is quite damaged from colouring, leaving is dry and often with split ends. Hopefully this little sample can transform my hair. Thank-you for sticking with me to this point, like always I will be reviewing items that I have used in the box within a month, to let you know how I get on. Please subscribe and follow to keep updated with my posts. Love that green nail polish!